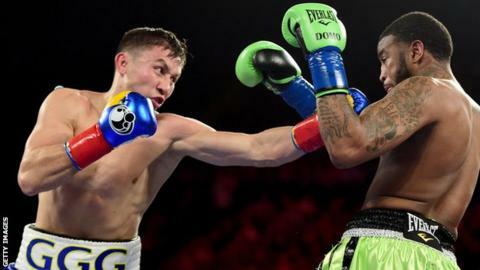 Kazakhstan's Gennady Golovkin defended his world middleweight titles with an early stoppage of American Dominic Wade, his 22nd successive knockout. Previously unbeaten Wade was knocked down three times before the fight was stopped with 23 seconds left in the second round in Inglewood, California. Golovkin, 34, who holds the WBA Super and IBF belts, has won all 35 of his professional fights, with 32 knockouts. "Give me my belt! I'm ready," he told WBC champion Saul Alvarez. "I'm here now and I'm here to stay. I'm not going anywhere. Let's fight." Mexican Alvarez fights Britain's Amir Khan in Las Vegas in May. Golovkin landed a right hand to floor Wade, 26, late in the first round. After the challenger narrowly failed to beat the count when knocked down again in the second, he was counted out by referee Jack Reiss following another powerful right from Golovkin. On the same bill, Nicaragua's Roman Gonzalez, 28, defended his WBC flyweight title with a unanimous points decision over Puerto Rico's McWilliams Arroyo.